During the Spanish period, the Royal Cities of the Kingdom of Sardinia – namely the seven towns of Cagliari, Sassari, Oristano, Alghero, Iglesias, Castelsardo and Bosa, unbound to feudal duties – were granted special privileges, including the possibility of establishing guilds. Such associations consisted of religious corporations of skilled craftsmen in the same trade: farmers, carpenters, blacksmiths, tailors, shoemakers, potters and carters. The corporation, put ‘on the lap’ – that is, under the protection – of one or more Saints (hence the Italian ‘gremio’, from ‘grembo’, i.e. ‘lap’), was regulated by statutes directly derived from Barcelona. The association ruled the activity of a whole group of workers, regulating the entrance of new members, the apprenticeship of novices and even an exam to pass from apprentice to master of art. It also issued laws on the subject of quality and prices of handicrafts. Mutual cooperation between members, assistance to the disadvantaged ones, funeral services for the deceased Guild members and participation to solemn festivals of the religious calendar, including the main feasts of the association, were strictly regulated and respected, under the penalty of fines and expulsions from the guild. Subscribers to the association were entitled to open their own shop and ply their trade in town. In the age of the Kings of Savoy, such an obligation became too restrictive within the limitations of the job market; therefore, in May 1864, a specific law decreed that these institutions had been disbanded. Since then, a few guilds turned into ‘societies’ that, abandoning the duties related to their trade, continued to hand down cults and feasts in the honour of the Patron Saint. Other guilds conveyed into 'societies' (‘Società di Mutuo Soccorso’) focused on the philosophy of mutual aid between members. Recently, some guilds have formed themselves into new corporations in a few towns of the Island, aiming at the recuperation of ancient festivals that went lost for a long time. On the contrary, guilds have always been carrying out their activity without interruption in Sassari and Oristano. For more than five hundred years, the guilds of the two chief towns have been taking care to preserve from oblivion their most characteristic events: in Sassari, the ceremony of the procession (‘Discesa’) of ‘Candelieri’, related to an ancient vow made to the Virgin of the Assumption; in Oristano, the historical equestrian tournament of the Sartiglia. The lack of documents does not help to determine the exact historical moment when guilds were entrusted the organization of the joust of Oristano. Despite of this, a paper reports the will written by a priest of the Cathedral of Oristano, who lived in the mid-16th century. He left a bequest to the Farmers’ Guild of San Giovanni Battista – namely, a property whose proceeds would have ensured the coverage of costs related to the event. 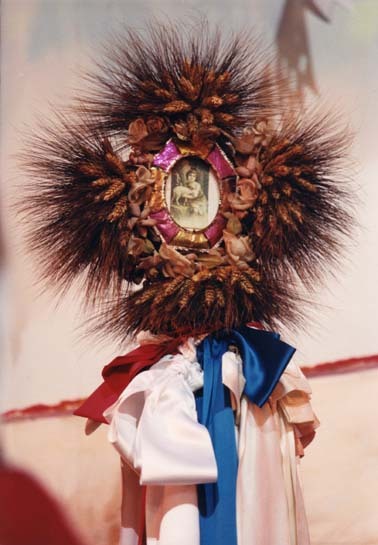 Still today, the tradition has not forgotten ‘su Cungiau de sa Sartiglia’, i.e. that land whose proceeds were meant to cover the expenses for the joust, everlastingly, under the penalty of depriving the Farmers’ Guild from its rights upon the land. Historically, the Guild of Carpenters of San Giuseppe, instead, used to support the organization of the event using funds raised by the official collection or by its own apprentices, as well as by donations directly made to the corporation by noble or wealthy households of the town.